On the surface it might seem that getting a website up is no big task. Delve into reality and you will find out that it takes more than one imagines to make a website successful. A successful website is one that not only gets adequate traffic but also serves as the foundation of your conversion. Anyone could build a website today using some popular website builder. This website, however, will be more like a student’s backyard project compared to the website done by professionals. It is often the case why many new startups are never able to compete with big companies. Webiz helps your business with the best and most complete website services London has to offer. It does not matter how small or large your business is because we take every project with the same level of seriousness. Your website’s visibility is at the core of our efforts and we make sure to use the most effective internet marketing techniques to make your website visible. Starting off with website design we accompany you for the life of your business with our ongoing SEO services. Our web designs are some of the most professional website designs you will come across. • We create mobile friendly websites i.e. your website is just as good on tablet or smartphone as it is on a desktop computer. 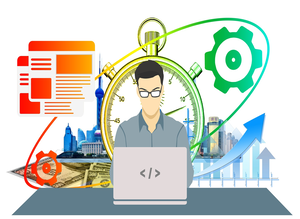 • We deploy the best web development practices and techniques to ensure your website is compatible with all major browsers while still offering fast and smooth operability. • While creating a user friendly website, we never forget about your major concerns i.e. website visibility. To ensure high website visibility we incorporate the best SEO techniques to optimize your website for all major search engines. • We are also equally savvy at conversion rate optimization i.e. making your website compelling enough to boost your conversion rates. • While other website services can completely ignore this immensely important aspect of web service, our professionals optimize your website for local SEO too because the potential of local audience is many times more than international audience. • We are the experts of SEO as well as Google AdWords – this allows us to put you in top Google search result rankings both in organic results as well featured ones. • We keep you reported on every project so you always know how successfully your campaigns are running. We also invest our time in making the reports as simplified as possible so you can tell at a glance what a report wants to tell you. • The biggest strength of Webiz SEO is its 24/7 customer service where professional representatives are always ready to help you no matter how basic or complex your questions are. Webiz SEO was started purely to provide internet marketing and website services as its core offerings. We promise you the best of website services in London we are doing what have always been passionate to do.